This modern attractive hotel situated in a quiet secluded area of Costa Meloneras overlooking the ocean offers the best of both worlds and boasts an ideal setting for those looking for a relaxing holiday. You can be as active as you wish here with an abundance of on-site activities. 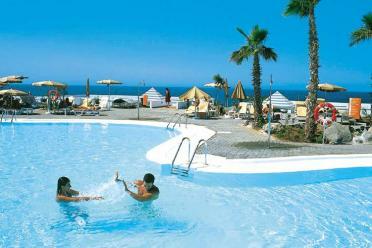 Part of the Riu chain, the Club Hotel Riu Gran Canaria offers high standards of accommodation, food, activities and entertainment to suit families as well as couples of all ages. Maspalomas Beach is around 800 metres away and is easily reached and the restaurants and bars of Playa Meloneras are around 400 metres away.